For the last 20 years New Zealand has been undergoing a rapid expansion in dairy farming, driven by commodity prices. New Zealand’s dairy exports, although small on a global scale of production, comprise 30-40% of internationally traded dairy products and are a major component of our gross domestic product (roughly 3%). Dairy farming is an intensive form of agriculture and its expansion into areas that were previously used for sheep and beef farming, combined with increased stocking rates in established dairy farming regions, has resulted in much greater leaching of nitrate to groundwater, and to surface waters receiving inputs of groundwater. About 40% of the nitrogen in our rivers originates from pasture. Increased nitrate concentrations adversely affect nitrogen-sensitive lakes, such as Taupo, by promoting phytoplankton growth, and cause periphyton blooms in some rivers. In addition, recent research has shown that levels of nitrate commonly found in rural streams maybe toxic to sensitive fish species, notably trout. Environment Canterbury has adopted a value of 1.7 mg N/L for nitrate-nitrogen as an upper limit for chronic exposure in order to protect 95% of aquatic species in some waters. Monitoring of streams in dairying catchments has shown that median concentrations are typically 1-3 mg N/L. Groundwater leachate concentrations of nitrate-nitrogen from intensive agriculture may in some cases exceed the drinking water standard of 11.3 mg N/L so there is a need to manage leaching losses and lessen the amount of nitrate entering waterways. There is also a benefit from cutting down another unwanted by-product of nitrate, nitrous oxide, which is a greenhouse gas and may be emitted from intensively managed pasture. The “leaky pipe” model of denitrification illustrating the effect of DCD (modified from Davidson, 1991). On farm paddocks, urea is excreted by cattle in concentrated urine patches and is mineralised to ammonium over a few days. Nitrate produced from ammonia via the process of nitrification is readily leached from soils. DCD, or dicyandiamide, is a substance widely used in agriculture over the last decade to inhibit the conversion of ammonium to nitrate and to lower emissions of nitrous oxide. It does this by blocking the enzyme that causes oxidation of ammonium to nitrate in soil and thereby slowing down the release of nitrate to waterbodies, and the production of nitrous oxide via the process of denitrification. What is unknown ecologically is if extensive use of DCD adversely affects aquatic ecosystems by causing a build-up of ammonia or in other ways altering nitrogen cycling process in wetlands so that they don’t buffer downstream waters from nitrate pollution. 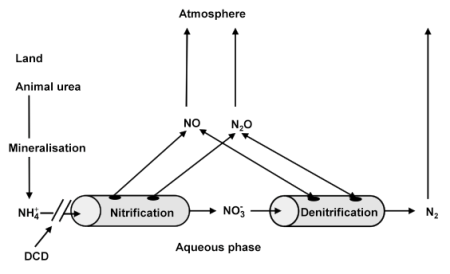 Complete denitrification (right side of the picture) entails reduction of nitrate through to nitrogen gas (N2) and completes the cycle of N-fixation by clover, followed by sequential production of urea, ammonium and nitrate. DCD offers a solution to some of the problems caused by nitrate in the environment and it remains to be seen what its future in New Zealand agriculture will be, given recent news to voluntarily suspend its sale and use pending further information about uptake by grazing cattle and market reactions. Dr Bob Wilcock is a Principal Scientist for water quality at NIWA. While I’m sure that Bob has very high principles, I think he is a Principal Scientist! The predominant toxic effects were nausea and vomiting (29%), headache (22%), contact dermatitis (19%), and erythema (18%). Based on the calls received by the NZNPC, acute exposure to hydrogen cyanamide in the workplace or acute exposure to those living within the vicinity of its use may not pose a significant immediate threat to human health. I will read George’s blog and see if it has anything useful, but the average baby is not concerned about High Fat Hep C diets.